BESTSELLING AUTHORS PATRICIA GREEN AND CAROLYN HEMMING show how the ancient superfood quinoa is revolutionizing the lives of people everywhere, addressing numerous health and lifestyle concerns such as weight loss, vegetarian diets, food allergies, gluten intolerance, heart conditions, and more. 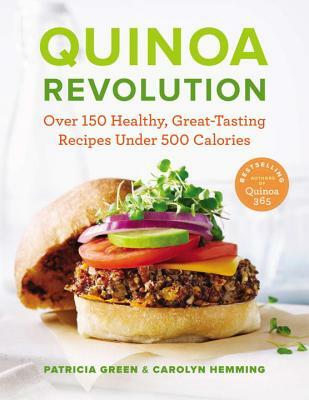 Quinoa Revolution demonstrates the extreme versatility of quinoa and how to increase your nutrition and revamp what you're eating now--with recipes that are great tasting and healthy. In addition to being one of the world's healthiest foods, quinoa's long list of amazing properties is what makes it so versatile in any number of recipes. Quinoa Revolution reveals how quinoa is not only used to boost nutrition, but how it can be used for any of its unique characteristics, including to enhance taste or texture, to thicken, hold moisture, replace gluten, increase protein, and more. Quinoa offers more than just salads. In everything from light snacks to full meals and even dessert, this nutrient-superior superfood plays a role. Healthful recipes include "Chipotle Corn Chowder," "Red Velvet Waffles," "Korean Barbeque Beef Wraps," "Black Forest Goat Cheese Brownies," "Ginger Peach Crisp," and more. Patricia Green andCarolyn Hemming are sisters passionate about healthy living.Both are busy balancing physically active lifestyles, careers and family.They are the authors of the runaway bestseller "Quinoa 365: The Everyday Superfood.""